The Geneva Motor Show is pretty frequently one of the best places to be for fans of supercars. A lot of exotic European metal (and carbon fiber) has the covers pulled off there, and this year McLaren specifically will have quite an impressive stand. 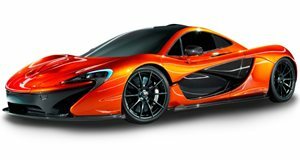 McLaren will be bringing its new P1 GTR, painted with a livery to match the car that will be sitting next to it, the Harrods Mach One F1 GTR, the car that took third overall at Le Mans in 1995 and sixth in 1996. We will also see the unveiling of the new McLaren 675LT, which will give us something new to drool over. Not to say that the P1 GTR, and even the F1 GTR aren't drool-worthy. In fact, McLaren has even put out a video of the two on the track together, which we are sure you'll find highly entertaining.